The JMC Academy is offering five (5) full year undergraduate scholarships for the 2012 Academic year. * These scholarships cover the tuition fees for the first academic year of study in one of the JMC Academy’s five Bachelor degrees. This first year is also commensurate with a one year complete Diploma course. The undergraduate scholarships are open to both Australian and International students. You may be an Australian citizen or permanent resident. Eligibility for overseas students is based on successful application of a student visa. This visa must be processed and finalised four weeks prior to course commencement. You will need to have an ATAR or equivalent examination score of 65.00 or above with supporting evidence of relevant work experience or portfolio of sample work. You must complete an Australian Year 12, International Baccalaureate in 2011 or overseas equivalent. You must attend a scholarship application interview at you local JMC Academy campus. A performance based audition will also be necessary for those students wishing to apply for the Popular Music and Performance Scholarship. You must satisfy the prerequisite studies for your nominated course. You must not have undertaken any previous study at tertiary level excluding TAFE and extension studies undertaken as part of a Year 12 program. Continuation of the scholarship is subject to satisfactory academic performance with maintenance of at least a credit average. Demonstrated interest in pursuing a career in the music and entertainment technology industry. A willingness to advocate the merits and services of the JMC Academy to the public at large as outlined in the JMC Academy’s Ambassador Programme information. (This programme will be discussed during the interview). Clear and engaging personal presentation skills. 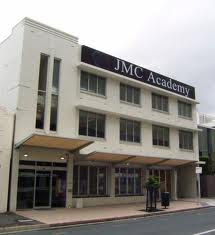 The JMC Academy undergraduate scholarship round for students commencing study in 2012 is now open and will close Friday 9 December 2011 with notification of final outcomes delivered by 29 January 2012. To apply, ask your Careers Advisor for a copy of the scholarship application form, or contact Student Recruitment and Admissions. Direct email inquiries may be made at sydney@jmc.edu.au, melbourne@jmc.edu.au or brisbane@jmc.edu.au. An application pack will then be forwarded directly to you. The application form is also be available for download at www.jmcacademy.edu.au. A fully completed scholarship and general application form. One reference letter of recommendation from a Careers Advisor, High School Principal, High School Music Teacher or International Student Agent. A portfolio containing suitable documentation, samples of student work, employer letter or any other piece of information that you think may positively support your application. Portfolios should contain colour copies and NOT original documents. Portfolios remain the property of JMC Academy. To complete your application and qualify for the scholarship award, above portfolio and documentation (sent to the campus by 5.00pm Friday 9 December 2011) must be followed up with submission of a copy of the student’s ATAR or equivalent examination score by Friday 6 January 2012. This award does not cover books, software, consumables, stationery, accommodation, or student registration fee. Selection is based on a combination of academic merit as demonstrated by an ATAR score of 65.00 or equivalent, and an interview with the JMC Academy’s Head or representative of the Department nominated for study and a JMC Academy management member. Applications for Popular Music and Performance Scholarships will also require a performance based audition in conjunction with the interview. Further details are outlined in the application form. Selection is based on interview performance and a weighted score on the quality of sample work shown and/or demonstrated work experience in a field directly related to the chosen course of study. The applicant’s financial status or personal circumstances will not be considered in any way in the evaluation process. The applicant will be responsible for ensuring that academic results are provided to the JMC Academy upon their release in order to be considered for a scholarship. The JMC Academy reserves the right not to offer all the scholarships available and to set a maximum limit on scholarships available for any one course or in any one faculty. Applications close 5.00pm Friday 9 December 2011. Short listed applicants will be notified by 30 December 2011 with a view to attending an Interview within January 2012. Students who have attended interviews, are then required to submit a copy of their ATAR or equivalent examination score by Friday 6 January 2012 or may bring a copy with them to the interview. Successful applicants will be notified of their scholarship award by the week ending 29 January 2012. If you are the successful winner of the Scholarship award, you must confirm your ability to accept the award with acceptance of the terms and conditions (those of which are outlined in the eligibility criteria above and as stated in the JMC Academy Student Handbook (issued at the interview) by email or letter by 5.00pm Friday 3 February 2012. In the event that your scholarship application is unsuccessful, please advise Student Recruitment and Admissions if you wish to proceed with a routine enrolment as soon as possible. If you need to defer your scholarship, you must first confirm that deferrals are permitted in your course. You will only be permitted to defer your scholarship if you are permitted to defer your course place. If you are approved to defer your course place, you must first accept the scholarship offer before you submit a request to defer the start date of your scholarship for one year. Scholarships can only have a maximum deferral period of one year. Commits a breach of the rules and conditions outlined in the Conditions of scholarship acceptance criterion. Demikianlah informasi Undergraduate Scholarships, JMC Academy, Australia kami sampaikan, semoga bermanfaat.